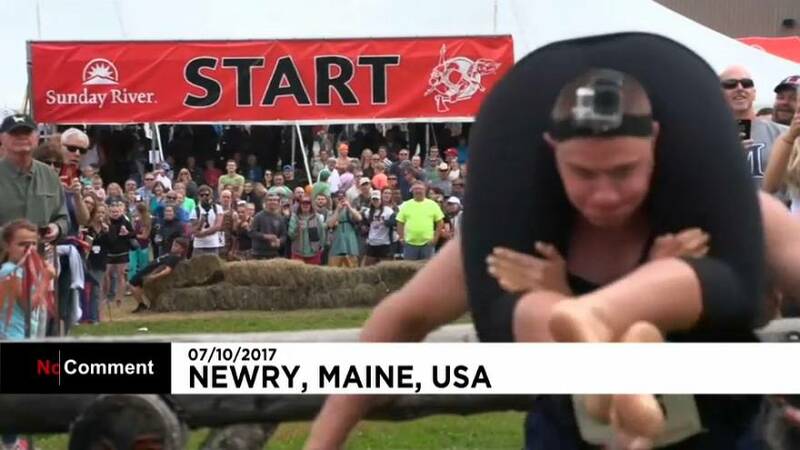 Dozens of married couples took part in the annual North American Wife Carrying Championship in Maine on Saturday. Spectators cheered as contestants hauled their significant others over obstacles and through a water pit. Jake and Kirsten Barney, from the state of Virginia, completed the regulation Wife Carrying course in 58.26 seconds to claim the top prize of 12 cases of beer and a check for five times Kirsten’s weight, in pounds, which equaled $630. The victory also earned the couple a trip to Finland for the World Wife Carrying Championship. Choice of hold is up to each couple, most of whom choose the Estonian Carry where the woman’s thighs rest on the man’s shoulders in an upside down piggyback. Helmets are not required but often used. Based on the 19th-century Finnish legend, wife-carrying became a sport as a result of men stealing wives from neighboring villages as means to prove their worth and strength to the famed henchman, Herkko Ronkainen, also known as Ronkainen the Robber. Men who were able to carry their stolen wives in the wilderness, over stones, stumps, fences, and springs, were accepted into Ronkainen’s privileged group of thieves.